This widget displays live reactions to your Facebook Live broadcast as animations as they happen. You can customize the speed, size, direction, and select specific reactions you want to show. 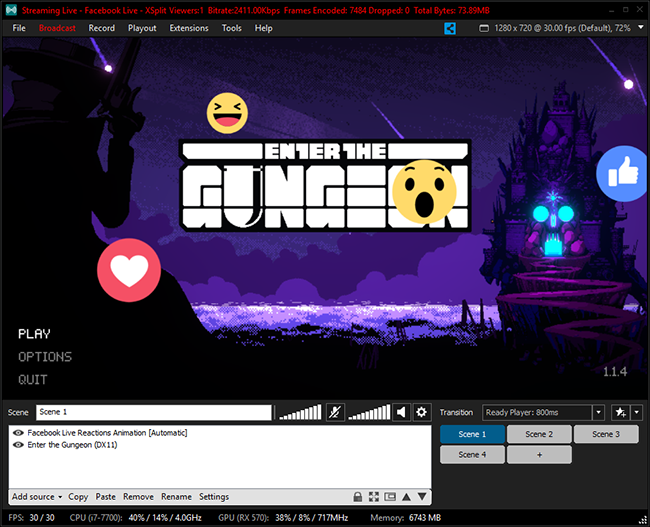 Go to Add source > Facebook Widgets then Live Reactions Animation. The Facebook Live Reactions Animation widget will now appear on your scene. 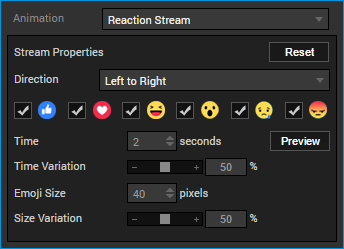 Choose whether to animate the reaction emojis as a moving directional stream(Reaction Stream) or have the reaction emojis pop in and out randomly(Pop In/Out). 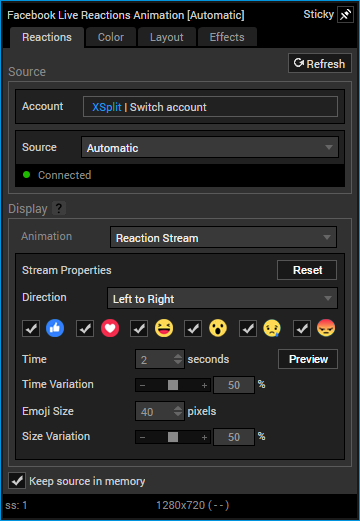 Choose which direction the emojis will scroll past in the Reaction Stream. Options for both horizontal and vertical travel are available. Enable or disable which reactions will show on the widget. Adjust the time frame that the animation will finish. The animation time can be changed to a minimum of 1 second and to a maximum of 180 seconds. Adjust the variance of the set animation time. Setting this to 0% will make all animations complete at the exact time set. Changes the size that the reaction emojis appear in the widget. The size can be as small as 8px or up to 999px large.